Barbara Pym is one of those authors who, to me, is absolutely perfect for a cozy, quiet winter evening at home, curled up with a big, warm cup of tea. As the tea warms your bones, so Pym's gentle humor warms the soul. But there is always a touch of melancholy and wistfulness in Pym's writing, an acknowledgement that no one's life has worked out quite the way they imagined. Pym's An Unsuitable Attachment has been on my shelf for a few years now, so it was a natural choice for me in my annual January guilt read of books that I own. It is a quick read. I finished it in a couple of nights. And it grew on me after I was done; initially on GoodReads, I was thinking about a 3.5/5. Now, as I reflect back, I think it more of a 4.5/5. But neither rating seems quite right, as I can't judge the book the way I judge most novels I read. Pym's writing evokes so much empathy for her characters, for the situations in which they find themselves. But the characters themselves don't win me over. They do not have much depth, we don't see very far into their motivations or reactions. They're kept always at a remote distance from us. Later on, I'm always very vague on plot details and characters. But Pym is such a master of emotion and the lightly-turned phrase that it is, in my opinion, impossible not to be impacted by her writing and the situations she describes, even if the characters are somewhat expendable. An Unsuitable Attachment is centered on church life in a small London neighborhood that is not quite up to snuff. You know that it's not up to snuff because there are a lot of immigrants there. The vicar and his wife, the Aingers, live happily with their cat, Faustina. New congregants Rupert Stonebird and Ianthe Broome (fantastically named characters if nothing else) move into the neighborhood, separately, and everyone speculates about their backstories. Mrs. Ainger wants Rupert for her sister but it seems that he prefers Ianthe. Ianthe, however, harbors a secret crush on her thoroughly unsuitable library co-worker, John. A couple illnesses, a trip to Rome, an awkward garden party, dinner party, and church gathering later, and things seem to sort themselves out. One of the things I love about this book and about Pym's writing in general is how she uses her novels to show us just how little we know other people. There are so many small misunderstandings in the book, between strangers, between acquaintances and friends, even between happily married couples. Everyone has insecurities, about small things - should I let the other two men order the wine, or does that make me seem less masculine? - and big - can I really be attractive to a man five years younger than me, or is he just after my money? They all say things they wish they hadn't, and they are all hurt by comments other people make. For example, one evening in Rome, the Aingers go out for a romantic scroll on their own. The normally very austere Mark Ainger clasps Sophie's, his wife, hand warmly and tells her how much he still loves her. Sophie reacts by saying that she hopes her sister finds love, that her sister was made to love and be loved. This was, obviously, not the reaction Mark was hoping for, and he retreats again into himself. We might think Sophie unfeeling, but we know that she is not because earlier in the book, she let something slip to Ianthe about how hard it is to break through Mark's tough exterior, to feel as though she has any real connection with him. "...in some ways, we're so far apart. I'm the sort of person who wants to do everything for the people I love and he is the sort of person who's self-sufficient, or seems to be..." She then goes on to compare her husband to her cat. "I feel sometimes that I can't reach Faustina as I've reached other cats. And somehow it's the same with Mark." Sophie and Mark both seem unable to talk to each other about their feelings, so instead they shower love on their cat, Faustina. Sophie also works very hard to get her sister Penelope happily paired off with Rupert Stonebird, though it doesn't seem as though the two have much in common. Penelope, for her part, really just wants to meet someone; she's frustrated and lonely, going home to a tiny apartment every night with no company. Ianthe, though, stood out the most in this story. I felt most connected with her, maybe because she is single in her 30s and seems mostly content with her life, though she doesn't like the expectations people place on her. In one of Sophie's thoughtlessly cruel moments, she tells Ianthe, "You seem to me to be somehow destined not to marry. I think you'll grow into one of those splendid spinsters - oh, don't think I mean it nastily or cattily - who are pillars of the Church and whom the Church certainly couldn't do without." (One of those Excellent Women, perhaps.) Ianthe asks Sophie if she feels that Penelope will also be one of those women, and Sophie firmly says no. Her own sister, of course, is not meant to sacrifice her life and happiness. 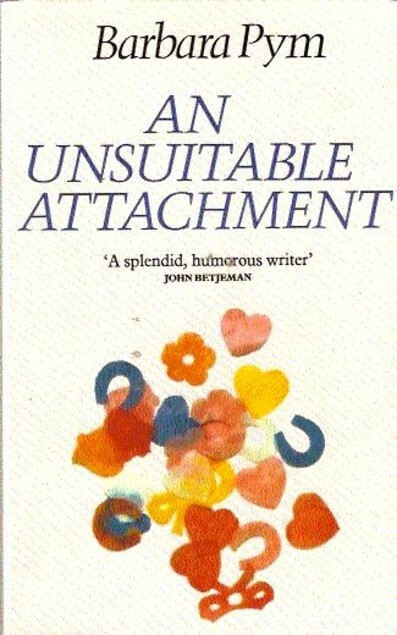 An Unsuitable Attachment is wonderful because it's so real. I talk at length above about how honest it is in its portrayal of relationships at every stage of development, but it is also wonderfully funny. There are so many everyday situations that make you smile, so many asides and inner thoughts that are just so perfectly shared, it is a true pleasure to come across them. Pym mocks her characters, but she does it gently, and she does it in a way that draws attention to the mistakes and missteps that we all make. "Be kinder to each other," she seems to be saying. "Give your friend/neighbor/wife/sister the benefit of the doubt." None of us is living a perfect life, but there are many memorable, happy moments that we can share. I've never read anything by Barbara Pym. This sounds like one I might enjoy, when I'm in the right mood. I haven't read anything by Barbara Pym in a long time, but it's time to get back to her, I think!